I submitted this to the Shebooks “I am Latina” contest. I just found out my essay didn’t win but I’m proud of the work I put into it so I thought I’d share. Keep writing & risking & submitting, writers. And let’s stay positive & driven, too. I grew up in 1980s Bushwick, Brooklyn, after the Fire Wars and the black out of 1977 left the neighborhood a pile of rubble. I was raised in a railroad style apartment by two women who loved eachother violently and defiantly. My mother rarely spoke of her native Honduras, but when she did, they were stories of hunger and pain. My mother grew up in the kind of poverty we only see in Save the Children commercials, and when she spoke of her childhood it was usually when she was calling us ungrateful. My second mom Millie loved her isla more than God. She showed me Boricua culture through music and in the way she closed her eyes and swayed her wide hips when she blared Hector Lavoe, Eddie Palmieri and Willie Colón; her eyes snapped open and she raged if the record player skipped. When she was all in, she clapped her hands hard and shook her body like she was in a revival tent; it was a return to God, all of it, all of her, with the beads of sweat on her upper lip and lining her pointy nose, and that gorgeous chipped tooth smile. It was easy to feel connected to my culture when I was in my neighborhood, there were piragüa carts on every corner, the bodeguero Miguel knew me by name and gave my mother credit when the food stamps ran out; where every passing car blasted freestyle music, a genre that was unapologetically ours. In the summer, there were festivals in Highland Park with rows of gambling tables of Black Jack, poker and roulette, salsa blared from enormous speakers, and the air was heavy with the smell of grease from the dozens of vendors selling pastelitos, alcapurrias and bacalaitos. Latitas of Budweiser floated in ice water in green garbage cans lined with black plastic bags, and the men gathered for impromptu jam sessions with their güira, guitar, a conga and a haunting voice that sang of longing and heartbreak and the homes they’d left behind. In the winter, the doñas gathered to make pasteles. Pounds of meat were seasoned with sofrito and recaito, and cooked on a low flame. Guineo and yautía were ground in huge vats, leaving knuckles raw and bleeding. When the ingredients were done, the assembly line began: one to spread out the parchment paper, someone to smooth a banana leaf in the center, another to pour a cucharrón of oil, red with achiote, then came the masa and the meat. The final step was to wrap the mound, the paper folded over precisely, the rectangle tied with a string then stacked in a pile. They had a rhythm, these woman. Their work was sacred. A tradition passed down for generations. When I went to boarding school in Wellesley, Massachusetts when I was thirteen, everything I was was labeled too loud and too much. They made fun of me because “you sound like Rosie Perez,” the only context they had of a Latina. It was harder to hold on to my orgullo when everything I learned in school was white and privileged and nothing like anything I’d ever known or loved. So I isolated myself and hurled myself into literature. I know now that I was searching for belonging. I was looking for someone, something, to affirm my existence. I needed something to claim. I became known among my professors as an avid reader. If you saw me outside of class, it was somewhere in a corner of campus, sitting cross-legged, my nose in a book. One day I was sitting on the mezzanine overlooking the cafeteria, so wrapped up in whatever book I was reading, I was unaffected by the swirl of teens giggling and chatting around me. An English professor, Mr. Goddard, sat next to me. “You should read this.” He handed me How the Garcia Girls Lost Their Accents and walked away. My first thought was, “Julia Alvarez? That’s a Spanish name.” I devoured the book in days. For the first time, an author I read looked like me and talked like me, and I could relate to her characters and their struggles in white America. I started eating up books by Latino writers, hunting them down however I could. This was before the internet so I asked teachers and dug in library shelves. When I went to college at Columbia University, I took every Latino literature class I could, and in my junior year, I joined the fight for ethnic studies because I wanted to study the immigration experience. I wanted to know myself. I trace that hunger for identity to that day when I was sixteen. 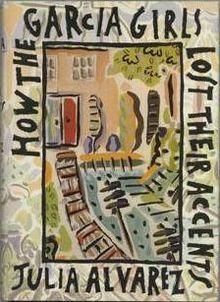 More than twenty years after reading How the Garcia Girls Lost Their Accents, I still count that book as one of the critical steps in my becoming a writer. The book instilled a pride in my heritage that went beyond my old neighborhood; one that I could carry anywhere I went. I’ve been carrying that torch with me ever since. What a touching and beautifully written essay. Congratulations and thanks for inspiring!